Wear a white tailored shirt which must be tucked into your waistband with a top button that must be fastened. the shirt, the tie must be of a suitable length. Wear the school jumper with the academy logo, this must also be worn at all times unless stated otherwise by a member of staff. Wear plain black tailored trousers with black socks. Tailored means not tight fitting or figure hugging and not made from stretchy fabrics. Any other style of trouser is not permitted. If a student chooses to wear a belt, it must be black and have a suitable buckle. Wear plain black leather shoes (not suede). All shoes must be free of any branding and must have black laces. All shoes must have a flat sole and sit below the ankle (not ankle boots). Other than the school jumper displaying the academy logo no other jumper should be worn. No hooded tops are to be worn on the premises of the academy unless they are being worn for PE. Outdoor items such as outdoor coats, hats and scarves can be worn to and from the academy; however these should be removed before entering the buildings. Excessive make-up: Excessive make-up is unnecessary and should not be worn. If make-up does not comply with academy policy then the student will be sent to their Pastoral Support Officer/Student Services and will be required to wash it off – a negative comment will be issued. Appropriate make-up is allowed and is defined as: foundation (appropriate to the student’s skin tone), black or brown mascara which should be worn discretely, a small amount of neutral eye shadow if required. No eyeliner, blusher or bronzer is to be worn. Hairstyles: Hairstyles should not reflect the extremes of ‘youth culture’, for example shaved lines and patterns on the side of the head. Hair should be cut no shorter than a Grade 2. Hair colouring must be subtle and in natural colours – no pinks, reds blues, two tone colour patterns or dip dye. Students with inappropriate hairstyles will be placed in Isolation for 3 days (KS3) or 4 days (KS4). School bags must be able to hold an A4 book – handbags are not permitted to be used by students. Students must come to school with a sturdy bag. The bag must be of a suitable size to hold their planner, equipment and books. From September 2018 we will be changing our PE uniform, including the logo and colour. Black polo shirt branded with the Bruntcliffe Academy logo. Black hoodie branded with the Bruntcliffe Academy logo. All of the above is available to purchase from the Price & Buckland website. All Year 7 students joining the academy from September 2018 will require this PE uniform as advised during transition. Royal blue polo shirt with the ‘Bruntcliffe Sport’ logo. Girls are to wear a grey hooded top with the ‘Bruntcliffe Sport’ logo. Boys are to wear a royal blue rugby shirt with the ‘Bruntcliffe Sport’ logo. By September 2019 all students will require the new black PE uniform as part of their academy uniform. Failure to comply with the rules above regarding uniform, jewellery, makeup and equipment will result in the student being sanctioned within our behaviour system. 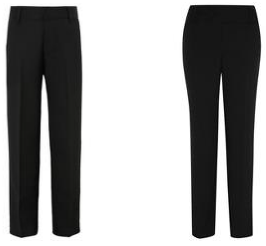 Tailored trousers as shown below for both boys and girls are available from suppliers such as Asda and Tesco from as little as £3. All students are expected to wear plain black leather shoes. All shoes must be free of any branding and must have black laces. All shoes must have a flat sole and sit below the ankle (not ankle boots).